Finalist in the 2103 GMG Practical Gardening Book of the Year Awards. 'A Year in Christine's Garden' is the utterly down-to-earth account of one women's passion for plants. 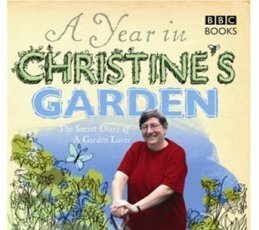 Recounting stories from her hectic life in horticulture, Christine Walkden's diary is a heart warming account of octogenarian neighbours, living with a film crew and helping friends with their gardening needs. Reflecting all the charm of her BBC2 television series, Christine's narrative paints a picture of the day- to -day beauty that surrounds her. She likes being outside, she likes walking her dog Tara, she likes watching the light change and she enjoys those little moments when everything seems right in the world. With irrepressible enthusiasm, she interweaves tips and advice to prove that the best gardens are approachable and achievable. Forget fashion, forget trends - Christine's garden is about no-nonsense planting and growing what you enjoy. As the year progresses, this warm, but frank diary brings to life all the moments of pride, excitement, relaxation and laugh-out-loud fun that makes Christine's garden a haven of contentment. Gardeners World and Amateur Gardening magazines. bulbs, baby bedding and seeds, click here for further information.